Yes, John Fleming did — over 1200 times — now you can help us tell his story on the big screen. What Does Retinitis Pigmentosa and Macular Degeneration Look Like? As a young man, John Fleming learned he had a hereditary eye condition called Retinitis Pigmentosa (RP) that likely would cause him to become totally blind. Eventually, he developed macular degeneration as well. When he first began to skydive, his sight was impaired, but he was not totally blind. 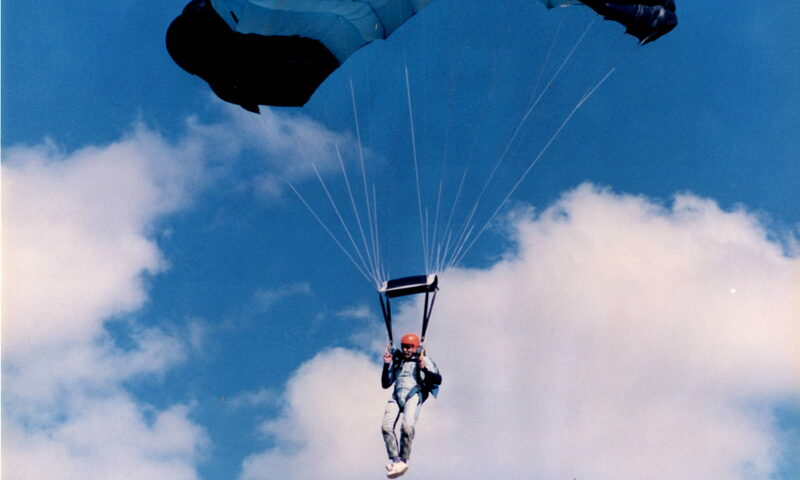 Over the years, “Blind John,” as he was known among skydivers, lost his sight entirely. But what does that look like? Many people assume blindness looks like complete darkness, but that’s actually extremely rare. Most blind people can at least perceive light. How that looks depends on the conditions causing the blindness and the individual person. Here is a series of videos that do a great job of explaining RP and macular degeneration, along with one man’s description of what he sees. 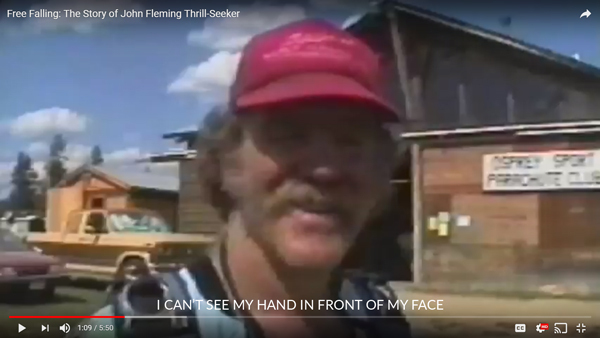 John Fleming’s experience with RP and macular degeneration may not have looked exactly like this, but it will give you an idea of the challenges John faced as a skydiver who was losing his sight. Note: since this is a silent film, I am including the explanatory text from the YouTube post for our readers who can’t see this video. I am in late stage RP, which is very limited but still have some usable sight. When I close my eyes to sleep, I see a tiny blue ball with webbing like a soccer ball. The ball slowly rotates one way, then stops and goes the other way. It is in the center and very small. It is a 3-dimensional image, that can be mistaken by most who see it as just lines swirling. If it is an “after image,” then it’s a new one on me, because it doesn’t fade for many minutes. the background around the ball is black. This animation is pretty close . Huge thanks to Steve Fialkoff & Family (My RP Vision on YouTube) for making these excellent, informative videos. Wondering How John Kept Skydiving Solo Even After He Lost His Sight? It’s an incredible story and we are on a mission to create a full-length documentary that explains how John jumped safely and why he was determined to keep skydiving after he could no longer rely on his vision to guide him down. Want to see this film made? Please give what you can to support our production costs at our Blind John Movie GoFundMe page. We are a small production team of family and friends, so truly, every little bit helps. Share this to help us spread the word! Next PostNext Why Would a Skydiver Need a Guide Dog? Flying Blind Productions, LLC is a very small, independent film production company organized by family and friends who loved John Fleming. We hope John’s story will inspire all who see it, raise awareness about eye disease, and show people that life after vision loss can be full and rich, though some creative thinking is required. Financial support from folks who want to see this movie made is critical to our project’s success. Are you inspired by this little slice of Blind John’s story? Would you like to see a full-length film about how he did it? Please, donate today at our GoFundMe page. Or, if you prefer to donate another way, read 5 Ways to Donate to the John Fleming Documentary Project for options.